"She doesn't get eaten by the eels at this time." You remember—and I know you do—that part in The Princess Bride where Buttercup has jumped off Vizzini's ship and the eels are about to get her? Just when she looks done for, the movie cuts abruptly back to the grandfather, who then explains to the sick kid that "she doesn't", as he puts it, "get eaten by the eels at this time." I mention this moment because it's a fabulous example of exposition, and how exposition momentarily changes the focus of the story in a way that can be detrimental to your reader's experience. Exposition is problematic for other reasons too (Google infodump if you want to), but this change in focus is what I want to talk about today. 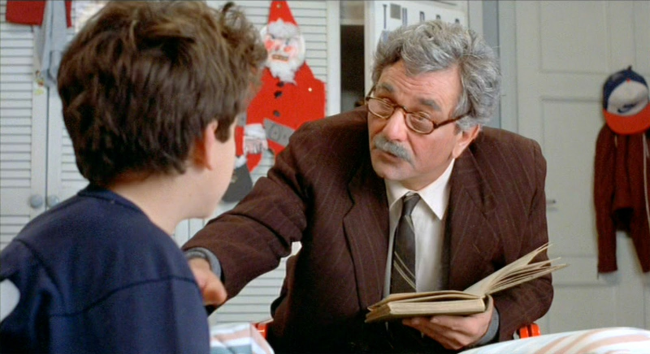 In The Princess Bride, director Rob Reiner plays this moment of exposition for comedy and uses it to build up the relationship between the grandfather and the kid. In the context of the film's meta-story about the kid and the grandfather, this is a brilliant move. But most novels don't have that kind of meta-level going on. Where is the normal focus? In novels that use any of the third person viewpoints, well-written narrative spends the bulk of its time showing us what the story's characters are doing and what is happening in the world around them. The focus is on them. The reader, consuming this narration, watches the characters going about their adventures through the lens of their mind's eye. When the narrative does this well, readers become immersed in the story. We've all had this experience while reading, when we're so absorbed that on some level we forget that we are ourselves engaged in the act of reading a book. All we're really aware of is what's happening with the people in the story. In normal narrative, the focus is the reader's focus, and it is directed towards the characters we're reading about. Lia flitted about the dining room, smoothing her freshly-ironed tablecloth and arranging two placemats and napkins. She laid Tamar's next to hers, sharing a corner of the table. But would he think her too forward? She pondered at the cupboard, reaching automatically for her everyday stoneware plates, before pulling down two of the Wedgwood china plates. Wedgwood china was the finest available. Imported from England, its decorations were of the highest quality, and its finish second to none. Third date or not, Tamar was worth it. Surely he'd appreciate being shown the best. She laid out the plates, sighed, and moved her place setting opposite his. In the first paragraph the narrative is doing its job: showing Lia engaged in preparations for her date, through a mixture of actions and glimpses into her thoughts. Then the second paragraph throws two sentences of exposition about the china at us. Those sentences tell us nothing about Lia. They don't clarify what she's doing. They give us supplementary information about the plates, as though the author is afraid we won't get the point that she's putting out the really good dishes for Tamar. Only having taken care of that little chore does the narrative return to Lia's thoughts and preparations. As you read the example, did those two sentences of exposition feel qualitatively different to you? They should, because they have an entirely different focus than the surrounding narrative. Those sentences feel different because the focus is the author's focus, and is directed at you. That's what exposition does: it shifts the story into a mode in which the focus flips 180 degrees around, pointing out of the story rather than into it. That feels radically different. It yanks you out of the immersive reading experience by reminding you that you are in fact reading a story told by an author. One who evidently doesn't trust in your knowledge of fine china or your ability to infer the significance of the china from context. Is that really what you want your readers thinking about? Or should they be thinking about Lia and wondering whether her date will go as well as she hopes? As novelists, an enormous part of our job is building empathy between the reader and our characters. It's a very short step from wondering whether Lia's date will go well, to hoping that it will just like Lia herself is. That's empathy, and it happens best when readers can enjoy an unobstructed, intimate view of what the characters are doing. When writers get out of the way so readers can just watch, they allow readers to form this strong connection with the characters. Exposition breaks that connection by forcing us to focus on something other than the characters. Authors should remain invisible so their stories feel as real as they can, yet exposition inherently reveals the author. Which—unless the story is intentionally meta like The Princess Bride—causes more problems than it solves.